TV show dates: December 14, 2018 — present. Performers include: Charlotte Best, Aaron Jakubenko, Peter O’Brien, Madeleine Madden, Mattias Inwood, Elsa Pataky, Marco Pigossi, Dalip Sondhi, and Chloe De Los Santos. From creators Stephen M. Irwin and Leigh McGrath, the Tidelands TV show is an Australian drama series. The story centers on Cal McTeer (Best). After serving years in a juvenile detention facility, Cal returns to the small fishing village of Orphelin Bay. She finally arrives, only to find her hometown awash in mystery. When a fisherman’s corpse washes ashore, Cal realizes she must figure out what is going on. That may sound easier than it is. Although the Orphelin Bay has no shortage of secrets, they all pale beside the community of unusual outsiders who live nestled into an obscured area of the bay — the Tidelanders. .
What do you think? Do you like the Tidelands TV series? Should this Netflix TV show be cancelled or renewed for another season? Just got into watching this and would like to see more. Definitely RENEW !!!!!!! Awesome show, seriously hoping for season 2!! Very enjoyable Ozzie show with quite good acting from the main cast members. Queensland coast scenery is also enjoyable. Please keep it going. Love this show!!!! Please keep it coming! Amazing show got hooked in the first 10 minutes. I love this show!!! I am anxiously awaiting more episodes! Please continue the series…. 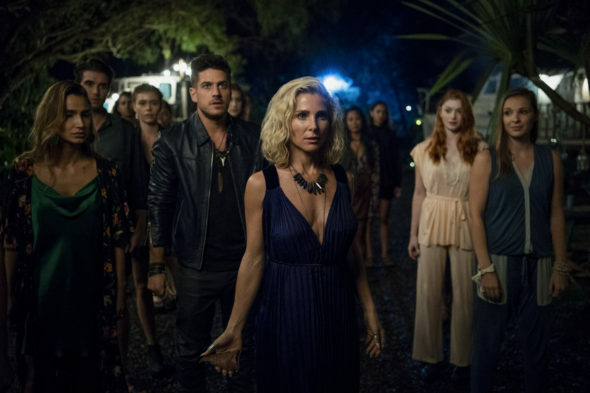 Please bring back more tidelands i loved the show amazing show ! My husband and I loved it. Please don’t cancel Tidelands. We rarely find a show this good that keeps both of us glued into the show. Fantastic show!! We binge watched the whole season in 2 days. Please, let’s see more!! Love this series! Keep them coming! Please bring Tidrlanders back. Awesome show! !